There are few better ways to spend an afternoon than with a stroll through a quaint, picturesque thoroughfare—and lucky for us, the South has plenty. The South has so many hidden treasures and undiscovered gems. Locations that girlfriends, families, and couples plan trips around visiting. The South has great restaurants, amazing shopping, beautiful beaches, and some of the best bars and breweries. We also have gorgeous spots that are off the map. Most of them don’t even run a half a mile long, and they were intended for long, leisurely strolls. The quiet walks that bring us back to life. Think about your favorite spot. Is it a beautiful block lined with colorful homes or a charming cobblestone street? Or could it be a picture-perfect road that leads to acres of green grass or a sandy path that leads to a serene body of water? We bet you can see it now. Those picturesque spots that bring you a sense of solace, peace of mind, and make you take a deep breath. How do we choose the most picturesque street in the South? Well, we tried and handpicked a few of our favorites here. In the 1800s plantation owners chose Craven as the prime location to build their summer homes due to the fact that the intercoastal breeze flows through even on the hottest summer day. 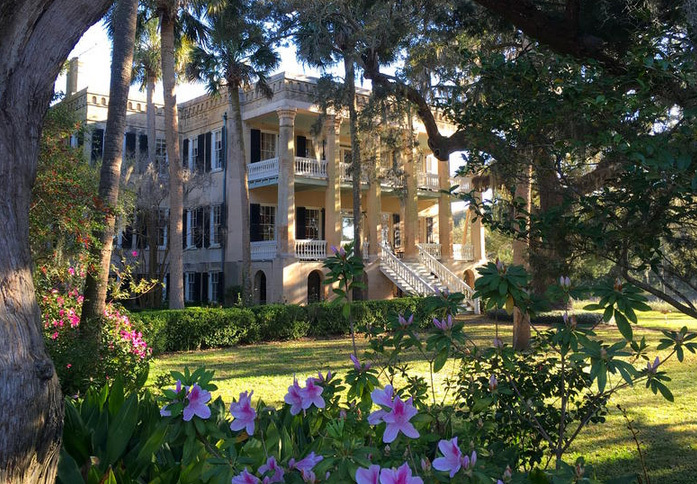 Here, you’ll scope out some gorgeous porches and, at the end, the classic “This View Brought to you by Beaufort, SC” sign, as well as the historic, three-story mansion known as The Castle.